The open-aired bus pushed through the northern highways. It was past midnight and I was struggling to make myself comfortable as the cool night air rammed its way through the open window. Together with ten fellow travelers, we made our way through the dark of the night to get a glimpse of golden sands of Bolinao. Breakfast was the first thing we looked for as we alighted in front of the old St. James Church in town. The morning air felt fresh after our overnight bus run from Manila. We walked along ‘til we found our query, a local tapsilogan. 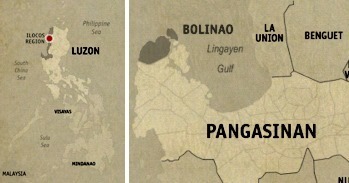 Pangasinan prides itself in having the best bangus, so that’s what I pointed to when the waiter took my order. With our appetite satiated, we came back to the Bolinao’s stone church to take a few snaps. The sun was already rising behind the squat limestone structure as we took out our cameras and pointed its lenses toward the structure. While looking for a good vantage, I saw a group of vendors selling local delicacies encased in bamboos. Binungay as the locals call it is a distinctly Bolinaoan treat. Made from sticky rice, coconut milk and cream; the concoction is cooked over a fire using bamboo as pot. To eat, one would have to break the bamboo in half. Its content looks very similar to the more popular suman. Circling the church, I noticed that the usual saints encased on niches at the façade were made of wood. It’s a rarity to see something like these on any church, even the old ones. Most parishes would’ve taken this inside and barred it with steel; it’s a sure magnet for thieves looking for antiques to sell to collectors. The St. James the Great parish was established in 1609 by the Augustinians and it shows its age on the patina of its outer walls. Its bell tower, which used to be the highest in the region, was destroyed in an earthquake leaving its lofty stature in half. It was surprising not to find a National Historical Institute marker plastered on its wall, considering its age. Similar to the old churches I’ve seen deeper in the Ilocos Region, the interiors of Bolinao Church’s is sparsely decorated. Its painted walls are bare and so are its ceiling. The rafters, which are now made of steel, are openly showing. I’m not sure if they’re in the process of renovating the church or if this is how it’s really supposed to be. Visiting Bolinao Church was a good, and should I say, somehow spiritual, way to kick off our Bolinao adventure. It showed us that there’s more to Bolinao besides its famous sand and waters (which we were all now rarin’ to see haha).